We’re always on the lookout for enthusiastic event staff to join our team! 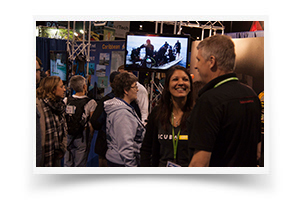 We are the leader in consumer event production across North America. Over the years our team has provided hundreds of thousands of people with unforgettable events and experiences. A big reason for our success is the quality of our team. We are constantly looking for people in all areas of event planning including: web and graphic design, operations, marketing, and sales. We look for people who are energetic, personable and motivated to help with various aspects of our thriving event business. Event jobs are an excellent choice if you are looking for an exciting, challenging and fast-paced job. If you are a confident, organized, and outgoing person, jobs in the event industry can appeal to you by offering the chance to lead, have a sense of accomplishment, be fulfilled, travel, and experience new things each day. We’re always on the lookout for people with a passion for events who are looking for new employment opportunities. Please email your resume to careers@nationalevent.com. We’ll keep your resume on file, then get back in touch with you about any jobs you should know about.